← We’ll Rave About Ex-Blades Dave – So Says Rose Tinted. This episode will be of interest to Gatehead FC, Kidderminster Harriers, Lincoln City and any BSP stattos looking for old and obscure results data. So to cut to the chase another look at the goings from a Barrow FC point of view courtesy of the Holker Street Newsletter from Ralph. Imps should take a look at Kidderminster Harriers correspondent Ian Nash’s article (second story) entitled EARLY SEASON and the Gateshead new stadium update is third from the bottom. Alfreton are one of them. (Hoskin) have seen him and know about him. He will give us defensive cover. were at the Barrow v AFC Telford game. excuses, they were there for the taking and we couldn’t take advantage. converted two cracking half-chances into brilliant goals. having dominated for much of the game. They didn’t use their heads however. the result of what appeared to the majority of fans to have been an assault. were allowed to persist, it spoilt the match for me. alcohol ban on all ISC coaches. has been in touch with some more details. have options to pay by the game, monthly or at the end of the season. (home GBP50 and away GBP50). 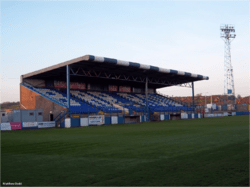 Friday 24 August: Stockport County v Gateshead (7.45pm). Barrow, Newport County v Hereford United, Tamworth v Wrexham (all 3pm). Tuesday 28 August: Woking v Braintree Town (7.45pm). worthy of a plug as those that are free are worth looking at. individual match details and the full player database. photographs, all by arrangement with the copyright holders. The results and dates of all English club competitions are free to access. Phase one will launch in August 2012 (ie now). What is included in the Phase One offering? (given time and resources of course!). abandoned seasons (e.g. Wigan Borough, Aldershot). question) in any round (including Qualifying and Intermediate Rounds). Group C: Football League Cup. Club Cup events, which are in Group G). Group E: Play-off and test matches. going’ projects by the database maintenance team. What is the work in progress? through, but Wood is confident a third option is nearing fruition. season-ticket, the club couldn’t survive without you! Messenger, Brady, Rigby, McKenna. Subs: McHugh, Proctor (Unused). Goals: John Brady 5, Craig Madden 9, 56 Kenny McKenna 22. Ref: R. Grayson (Burnley). H/t: 1-2. Att: 498. Posted on August 24, 2012, in Blue Square zone, Holker Street Newsletter and tagged Gateshead FC, Holker Street Newsletter, Kidderminster Harriers, Lincoln City FC. Bookmark the permalink. Leave a comment.